Air-brushed to give it a soft, waxy exterior finish, the Candle Chrome MonstroBot looks completely harmless and actually quite welcoming! The promise of warmth and birthday celebration lures the unsuspecting mice close, unleashing a torrent of wax upon them! The Candle Chrome MonstroBot Skin can be used on the Chrome MonstroBot. The weapon's stats (power, power bonus, attraction bonus, etc.) are not changed. The Candle Chrome MonstroBot Skin may be made available during the annual MouseHunt Birthday event and can be traded on the Marketplace or through Give To Friends. 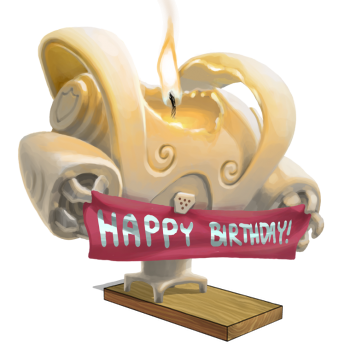 5 March 2015: The Candle Chrome MonstroBot Skin was introduced during MouseHunt's Seventh Birthday. This page was last edited on 9 December 2017, at 09:21.